They don’t build them like they used to. Well, they might not, but Greg Roy, sure does! When he’s not busy making people feel right at home (as a real estate agent) Greg is often found on deck at his Auckland workshop – a veritable Aladdin’s cave of marvellous machinery. Amongst the vintage and classic cars, a canoe and even airbrush paintings, is Miss Moonshine, a replica of its alter ego, a 1950s hydroplane named Alter Ego. While faithful recreation in the form of Miss Moonshine – the third of a series of vintage boats he’s constructed – ultimately came down to the availability of plans, all Greg’s projects seem indicative of a fascination with the way we were. “Aside from some minor points, the construction method and materials are identical. I have a passion for old stuff, I guess, from when it was real, made out of wood and metal; before they invented plastic. There is a real challenge in staying true to the materials and components of the day,” he says. A former motor mechanic, Greg says he first developed a fascination with boats while growing up near beaches of East Auckland. This passion was further fuelled when he experienced a sea change of sorts, taking the helm of a new company, Formula Boats, in the late 1980s. In 2000, Greg first put this knowledge into practice on a replica 1930s’ Barrelback runabout christened, Bootlegger. Five years later, a sister ship, Gangsta, (a 10 foot speedboat of a similar vintage built with his son, Brad) was launched. “The names? Yes, there’s a theme going on there all right! 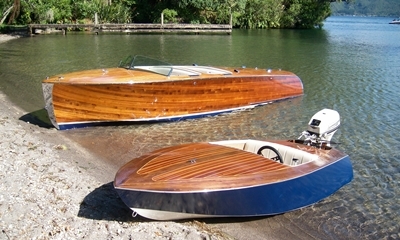 Bootlegger got its name because boats of that vintage were used to run bootleg booze from Canada to the States. But, it has a double meaning. Because it’s essentially a copy of another boat from that time, in itself, the Bootlegger is a bootleg. Miss Moonshine carries this theme further. Although ‘Miss’ is not short for Mississippi, Greg confirms it is simply a common honorific given to racing boats. 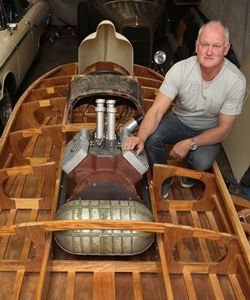 While in no particular hurry to complete his current project, he expects Miss Moonshine to turn a few heads at Lake Rotoiti’s NZ Antique & Classic Boat Show next summer. In fact, she could even follow in the wake of Bootlegger and claim the Jens Hansen Cup, awarded to the best boat with the best story on board, not necessarily the craft which is fleetest of propeller. “We are not really supposed to race as such, but we do a few laps and there’s a guy at the end with a flag to tell you when you’re finished, so make of that what you will! We usually ‘win’ that,” he laughs. Although he confirms no other boat he builds will float before Miss Moonshine runs, Greg is already preparing for his next project, a 1920-30s’ gentleman’s racer. But retirement fund these boats will never be. While some may say that ‘if you love something, set it free’, Greg is adamant that he will not cast away a single vessel. “These boats really are like the last bastion of freedom when it comes to vehicles. Unlike cars, it’s pretty unlikely you’ll get a speeding ticket, and unlike hot rods, there’s not such a rigmarole in how they must be built,” he explains. And passion, but that’s obvious.